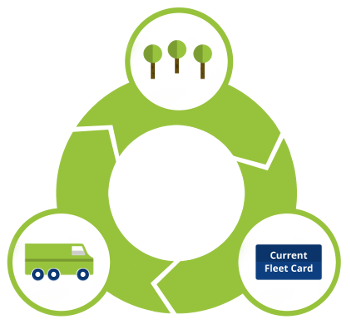 The FLEETCOR Clean Advantage® is an eco-friendly program that gives fleet card users the advantage of offsetting the CO2 emissions of their fleets and vehicles. As part of the Clean Advantage® Program, FLEETCOR supports a variety of initiatives, across numerous projects, that sequester CO2 locally and around the world. As always, the euroShell Fleet Card by FLEETCOR* provides you and your fleet significant savings and helps you reduce your expenses. Now, with the euroShell card by FLEETCOR, your company can positively contribute to saving and protecting your community’s environment as well. *Using a euroShell Fleet Card by FLEETCOR is considerably rewarding. Whether it is the convenience of Shell locations or the quality of Shell Fuel, the euroShell Card by FLEETCOR has you covered. Clean Advantage® is a turnkey sustainability program, brought to you by FLEETCOR and GreenPrint. This program automatically calculates your fleet’s CO2 emissions and significantly reduces your fleet emissions through proportionate investments in projects that sequester CO2 from the atmosphere, making your vehicles the cleanest on the road – even cleaner than the average electric or CNG vehicles. The Clean Advantage® program invests in many projects that not only reduce CO2 , but also help to provide habitats for wildlife, clean landfills, and develop local parks and recreational space for people to enjoy. Support – Working out the exact amount of CO2 your vehicles are producing can be a very complex process, but with the the Clean Advantage® program, we take care of this worry for you. Simplicity – It is all taken care of with a cost of 1¢ per liter per national transaction with refueling added to your current invoice.